All-in-one keyboard platform with 6" height range, 360° swivel and +10°/-15° tilt. Lever handle ensures positive lock on platform height; just flip lever to the right, adjust height and move lever back to lock in place. Adjusts to 1/2” above mounting surface and 5 1/2” below mounting surface. Tilt is adjusted with separate pull lever. Standard all-in-one platform with wooden construction minimizes bouncing. Mousing surface can be positioned right or left. 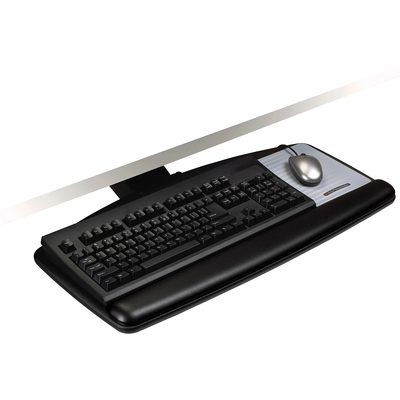 Full-width leatherette gel wrist rest with antimicrobial product protection. Precise™ mousing surface extends battery life. Increase comfort and productivity by placing your keyboard and mouse at a proper level. This keyboard has a lever adjust arm that ensures positive lock on platform height—just flip lever to right, adjust height and move lever back to lock in place. Tilt is adjusted with separate pull lever. Adjusts height to 1/2" above mounting surface and 5 1/2" below mounting surface. Standard all-in-one platform with wooden construction minimizes bouncing. Includes all-in-one leatherette gel wrist rest with antimicrobial product protection and Precise™ Optical Mouse Pad that can be placed on right or left of keyboard.